Software should be viewed holistically, in my opinion. I know that in 4 years most of my students will not be using the same version of any software I teach. I do want them to have deep knowledge of many different programs, however, I want them to know that no matter what software or "apps" come their way that they are able to take the app, understand the app's purpose, an utilize it in a functional way in a very short period of time. Instead of the standard 4 software application program 2 semester program that I ran 10 years a go when I started this job, we start off with a bootcamp using software that I know they do not know. After learning a method of how to intuitively learn new software and viewing a video that introduces them to the concept of building a PLN, we embark on our "software exploration" project. I thought I'd share that with you today. Before we began, I showed them the video about Dantae Thrash, the Evansville Indiana student who linked himself into the Lego Brick Filming online groups. We talked about help files built into software programs but the importance of building a Personal Learning Network when you have something you are passionate about. We pulled up a few message boards for on of our programs to show how to determine which message boards and forums have things going on, which do not, and how to join in. Below you can see the Online view of the One Note notebook. It has a little less functionality than the offline version but still means that students can access the information anywhere. We had a challenge signing up for Windows Live ID's -- Windows Live ID service only allows 2 people from one IP address to sign up for their service in a 24 hour period! It took us 2 weeks to get my 90+ students into our one note notebook! You can, however, use Microsoft's Live@edu setup which is their alternative to Google Apps for Education. We've been on Google apps, though with no plans to switch at this point and so live@edu setup by importing a csv file was not for us. To work around this problem, the only solution they could offer was for me to bring in my mi-fi hotspot. I had students register on my iPad on the hotspot and reset the hotspot every 2 sign ups. YES, it was cumbersome. It is worth it for me, but I don't recommend it for you. Needless to say, we had a great discussion about IP addresses, spammers, and how the Internet routes data. AFTER Windows works through this problem, I highly recommend that every class have their own class notebook. As much as I love Evernote for keeping my files, nothing compares to One Note for taking notes in class. If you want to link One Note on the ipad, the One Note app is decent but right now Mobile Noter is a better app for this. You can see the project page for this assignment. 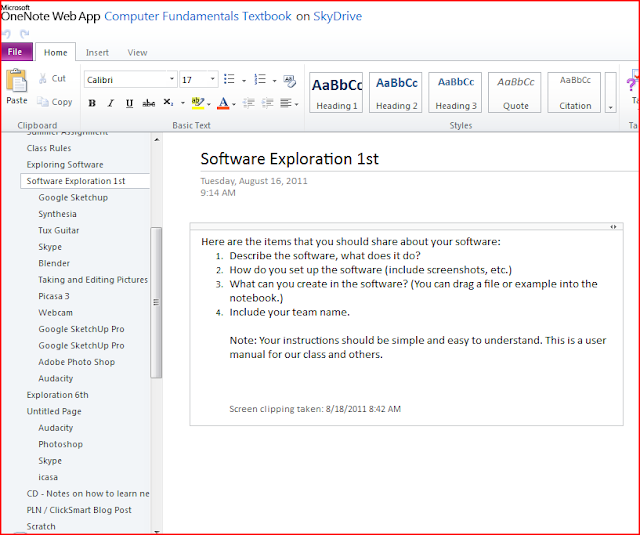 the software exploration assignment and on the left you can see some of the programs my students shared. Blender - A student showed the basics of Blender, the 3D object creation software and also showed a famous movie filmed entirely in Blender. We discussed machinima. I noted that there is a lot of interest in this but mentioned how the mesh objects here could be exported and imported into our Open Sim Island and also the Jibe worlds that we'll be working with this year. (I'd like them to have their own 3D virtual world embeddable on a web page in their personal portfolio using Jibe. Great tool.) The students agreed that this is definitely a higher end program. We also discussed Geometry and how the x,y,z axis are important in 3D work. They seemed surprised to see that Geometry had real-world uses. Google Sketchup - Another 3D object creation tool, the students shared with their friends. The students LOVED how you can import 3D objects stored in the special google search engine for 3D objects. They were excited to pull in these objects and realized that they can export them into virtual worlds just like on Blender. After this student presentation, I took the boat that they pulled in and figured out how to export as 2D (I wanted them to see how I figured this out as I haven't used Google Sketchup before) - I adjusted the camera a tiny bit and took about 10 pictures that I exported into a folder entitled "boat zoom" and pulled them into Pinnacle Studio to make a small 1 second clip zooming in on a boat. This was a demonstration of how easy it is to film machinima - just moving objects a small bit at a time and exporting the image. I think this is something they now see and feel is doable. Audacity - This group demonstrated how to hook in our M-Audio Podcast Factory microphone into the computers and imported some audio and showed how to record over, edit the voice, remove things, and apply filters. They also demonstrated how to run an instrument app on an ipad or ipod Touch and record into audacity. (I had to take a side trail and talk about what a male to male, male to female, etc. cables are and how to tell and ask for them -- it is a 'fact of life' that they need to understand the different kinds of cables (pardon the pun)). I have to get a splitter so they can hear what they are recording as they are recording it because for some reason our MAudio box isn't letting us record the ipod/ ipad through the mixer box although you can hear it through the headphones. The presenters shared a song that they had remixed and I talked about how the award winning cheerleading squad from last year had mixed their own music in the computer lab using audacity. TuxGuitar - This group went all out. This program is for writing sheet music off of guitars and was a new one for me. You play the guitar shown on the screen and the program writes sheet music. This team also showed how to find midi music and import into Tux Guitar and to turn off and on tracks. We then hooked the computer with Tux Guitar into another computer running audacity and they realized how they could write, edit, use midi files on one computer and then record the track into another. Synthesia - This game was brought in by the Tux Guitar students. They had learned everything about Tux Guitar and wanted to bring in this program. This teach-yourself piano game uses the computer keyboard but could use a real keyboard. They talked about how you can learn how to play almost any instrument. So, I took them to one of my favorite Kevin Honeycutt videos about using the ipod/ iphone as an instrument. We discussed the evolution of music. Whew! Just two days. Note that all of them have screenshots and instructions for the "computer user manual" we have built in one note. Then, we went into photography with Picasa, learning how to take pictures on our webcam and a discussion about resolution (or rez), Picnik (the online photo editor integrated with Picasa) and also about the sort of scary "Face finder" service now integrated into Picasa. We discussed how our Face is now a fingerprint of a sort. We then moved into Skype. It was fun on the Skype session as I have the whole class get up on Skype. This is important to me because if I am ever out of town or home sick (or home taking care of a sick child which is more often the case,) I am able to skype into class to help students with issues. I'm really always "there." We learn how to group skype, but then I take my iPad and three boys into the library and have them skype back to the class. Then, I give them permission to take the class on a 4 minute tour and they take my ipad around and say hello to the librarian, the teacher coming from the copier. We discuss the mobility of VIDEO connection. This is a fun conversation. Oovoo - The students asked that I install Oovoo on several computers because they wanted to compare and contrast Skype with oovoo which lets you do 12 way video chat. The kids say they really like Oovoo and are using it heavily. We are just getting into the other class but I'm excited that three of our young ladies have jumped into Scratch and are loving it. They will teach the class today. Before this, I have already laid the groundwork of my paperless classroom, how to print to PDF from word or any application, how to open into Google docs and save down from Google docs. How to move files around and organize them. Can they learn to use forums and help resources when they have no prior knowledge? If not, I guide them in the learning process about how to FIND resources and people when they don't have prior knowledge. I set the stage for students-as-teacher and discuss presentation skills. I let them start and share with each other and then I build upon that with certain things I want them to know. We set the stage for super fast student-empowered learning where the tool is less important than finding a tool that will do what you want. The artifact we are trying to create becomes more important than the program we are using. Surely, such planning seems like chaos to many, however, since I've started the year with this, I've found that I'm spending less time at the front of the room droning on and more time actually getting into the meat of the projects that make this such a fun class to teach. I want them to be master of technology NOT the other way around. I've gotten approval for a "Freshman project" of the student's own deciding due next May that will take 30-50 hours of time (I will give 30 hours of class time) that will be self-directed independent projects of the student's own choosing. This is modeled after the "senior project" idea in Evansville, Indiana that inspired DanTae in the video at the top of this blog post. We must find student interests and help relate technology to turbo charge their careers and lives before they even graduate. Flawed and imperfect as it is, the 6 class days required to do this activity start my year well and with a powerful message that we are in this together. Learning together. Pushing forward into a future that is not yet written we will lead and no longer complain when our software is upgraded on us because we have powerful decoding skills that will let us master any app in our digital destiny. Join us Monday for "Meet the Flat Classroom." I'm so happy to say that after our struggles with a potential hacker on our blogs/ google docs, etc. of the past few days (as I blogged yesterday), we've worked through the issues and our application forms are back up and running. THANK YOU to all of our friends who let us know about the problem and our friends at Google and my fellow Google Certified Teachers who helped us with the problems. We're excited to share where global collaboration is heading in our corner of this beautiful educational global collaborative landscape. Feel free to join us and learn more about this and our book and how you can access free resource and information as well as join our projects or learn about our book. Julie and I will be there together for this action packed hour on Monday, so join us. The official announcement is printed below. We are delighted to invite you to an online 'Meet the Flat Classroom®' meeting early next week. This is an opportunity to learn more about Flat Classroom® Projects and our non-profit organisation, Flat Classroom® Conference and Live Events Inc.
FLATs (Flat Learning Action Talks) - The online talk you'll want to hear! Flat Classroom Book - Book Clubs and ways you can use the book to connect for global collaboration whether you want to join Flat Classroom or not! Update: We are not sure why or how this happened, but we are back up. Tons of passwords changed. Thank goodness for Backupify - the service we use to back up our Google docs. I will share about this later. Thank you to the Google Certified Teachers, Google employees and others who helped us with this problem and thank you especially to Lisa Durff, our Flat Classroom coordinator who really helps us keep things running. Have we been hacked? What has happened? Right now, Julie Lindsay in China and I communicate through Google. Our forms, etc. are through Google. She is in China and has to use a firewall to use Google. Has she been hacked or is so much traffic out of China being hackers that they think she is a hacker? Who knows, but either way, our forms our down and much of what we do with Flat Classroom is DOWN. We're working to restore our application forms. I'm also getting this notice SOMETIMES on my blog which makes me think that perhaps something I'm linking to that is Flat Classroom related has been compromised. Please oh please don't cause me to lose my blog, Google. Here is the message I've gotten sometimes on my blog. I've scanned every line of code on my blog - it is definitely something I am linking to that has been hacked and not my blog itself. Any advice is helpful. I've reported this to Google as many ways as I know how. I don't know how far this will go but know that Flat Classroom isn't going anywhere -it make take some time to get this back together. I think this is coming from Julie's account as her blog has now been removed! She is going to just flip out! Today I demonstrated Google plus to my students as we compared and contrasted Google Hangouts with Skype and Oovoo. As I went into Google plus, I just happened to be there as Stephen Downes pointed out a grammatical mistake I made on my Leadership post yesterday. "Hey, Mrs. Vicki, is that guy talking about you?" Stephen Downes' Google plus post about my mistake. I don't want to debate my mistake here. I made one. Period. I aim for zero grammatical mistakes and this mistake wasn't in the original post but came when I went back and tweaked the post this morning - as I often do when I think I've written something I like. I didn't proofread after I made the correction and thus embarrassed myself greatly, especially because someone of the stature of Stephen Downes caught it and let everyone know. I totally goofed up. Quite a debate with those who know more than I do about grammar has ensued, and yet, I don't defend my grammar. Here was my final comment on Google+ about why this particular post made me so incredibly angry. I am not qualified to debate grammar and will let those more studied in the field do this. I do know subject and verb agreement and if I had proofread more thoroughly I would have caught it. Again, +Stephen Downes the issue I have here is that you called me on a mistake but did not tag me in the post, thus denying me the ability to 1) correct myself 2) learn from this and 3) include me in the conversation. It came across as a behind the back jab. THAT I made a mistake doesn't make me angry at anyone except myself - but with what I've been through lately including a pretty bad illness - I'm going to cut myself some slack and hope that the meaning behind my words is powerful enough to bring people back to my blog. What made me angry is that you didn't tag me in the Google plus post and I found this by accident. Thank you +Keith Hamon for sharing your thoughts. You are more qualified to discuss this than I am. I was angry because this "felt" behind my back. He didn't tag me and so I might not have seen it. When you talk about someone on a social network like Facebook or Google plus that it is BAD MANNERS to not tag them in the post. We discussed what would have happened if I hadn't been online at just the moment Stephen wrote this and WHY that made me angry. Sometimes when something is new even experts make mistakes. I pointed out to them that Stephen Downes is someone that I respect a lot and learn a lot from his blog. I consider him an expert in the field of educational technology. I also think that from now on he will double check his tagging of people in Google plus as I will also work harder to do a better job of proofreading. One mistake does not write his expertise off in my book - hopefully one grammatical mistake will not write someone off in the books of my readers. If it does, then so be it. I feel like people deserve the benefit of the doubt. A typo should not discredit someone's entire statement especially when written by a single author. When Stephen says the following statement, he misspells my name (I guess he didn't proofread either) - does that mean he doesn't know what he is talking about either? Of course not, he made a typo. "Why does this bother me? Because failure to align subject and verb demonstrates that the writer quite literally does not know what he or she is talking about. Vicking is talking about"
Making social netiquette gaffes can also harm your credibility. The standards you use for others will come back to you eventually. In this case, in the same post. He publicly called me on grammar and as he did, he made a social media gaffe, so the public timeline also was told about his gaffe because he had made the conversation public in the first place. I hate it was public but it is OK in retrospect as there are a lot of teachable moments here. You should always fix your mistakes if you can. Mistakes are human but not fixing your mistakes is unprofessional. Fix your mistakes, try to make things right. I find it ironic that this whole thing started on a post on Leadership that I wrote On Leadership and the error was made in a piece of the article I wrote about criticism being doled out. Now, I'm glad it happened. I hope that Stephen knows I continue to respect him and I hope he will admit his mistake as I have admitted mine and that we can go forward as fellow flawed human beings and continue to share these teachable moments that invariably happen. I also hope that those of you who write will not be afraid of writing because you know you will make mistakes. We all make mistakes -- even well educated people. One mistake does not disqualify you from living or else we'd all be dead. We have to swallow our pride and back up and see what we can learn. Remember your noble calling teacher and that it is OK to put your own mistakes on display to make a teachable moment for the students you love! As I've shared with you before, if you shape your habits, you shape your destiny. Brian Tracy says that "95% of what we accomplish is a result of our habits" and I believe him. You don't have one really great workout and lose 30 pounds. In fact, I can attest to the fact that you can have 300 mediocre workouts and lose 30 pounds! Anything worth doing well is worth doing poorly at first. You don't write one amazing blog post and build a career. You write quite a few blog posts and eventually a few amazing ones will emerge. The majority of posts for most bloggers don't receive comments or tweets or anything - but they are read by someone, usually! 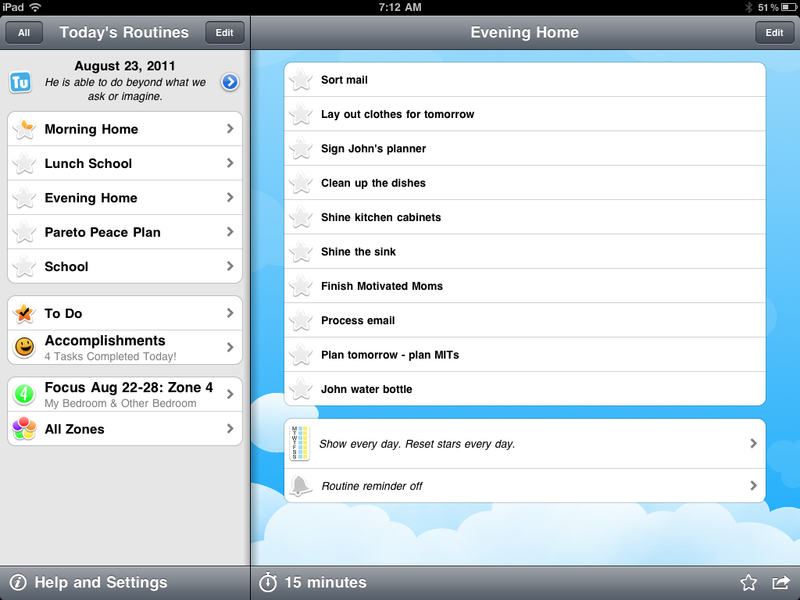 I use the Home Routines app to create routines to help stay on top of things. If you look at what successful people do and emulate what they do - you will be successful in that area too. For housekeeping, I follow "The Fly Lady" For school, I pretty much know what needs to be done every day, consistently. 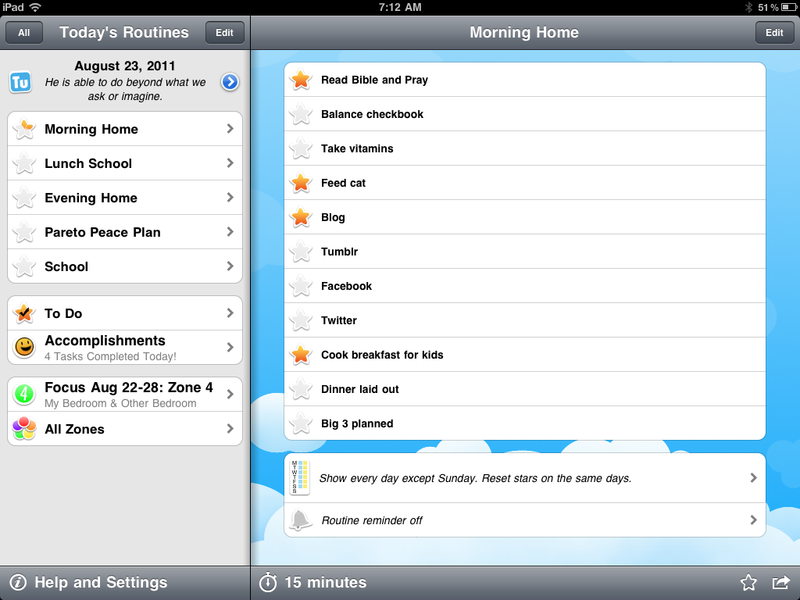 Using the Home Routines app, I'm able to set up things for each day of the week (if I wish) or checklists to kick start my productivity. 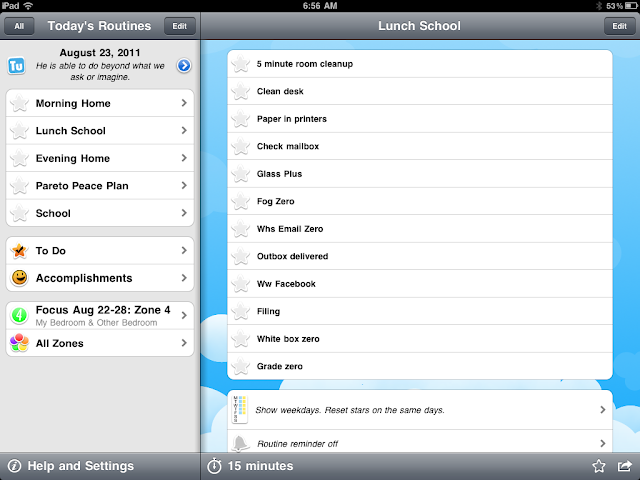 At the beginning of my planning period (which includes my lunch time) I always open up my quick checklist and race to punch out the items (as many as possible) before my Smart Ones finishes in the microwave in the teacher's lounge. This way, everyday, my room is cleaned, smells good, is sanitized, printers don't run out of paper, my inboxes are down, and I keep up with grades. These are the small things that when they accumulate make my life a nightmare or interrupt the flow. 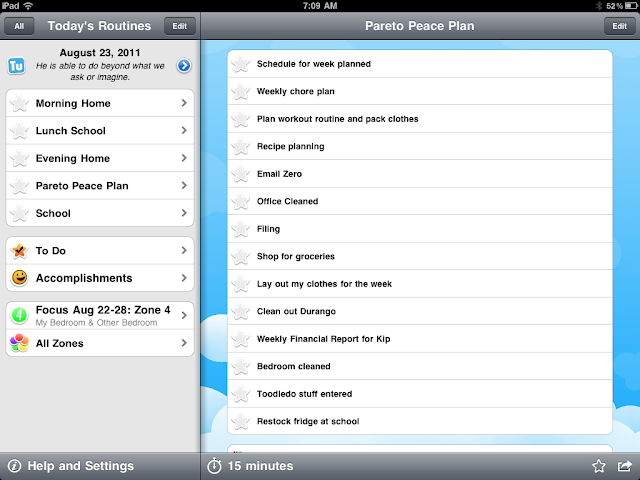 Then, I have a "Pareto Peace Plan" list. Pareto's principle says that 20% of things can account for 80% of the effect. So, there are a few activities that have a massive spillover effect into my life. If I do them consistently every week my life is better AND the life of my children and family is better. My weekly routine that helps me keep on top of little things with a big impact. Here's my Pareto's plan. This resets every week so I have to do this each week to stay on top of things. 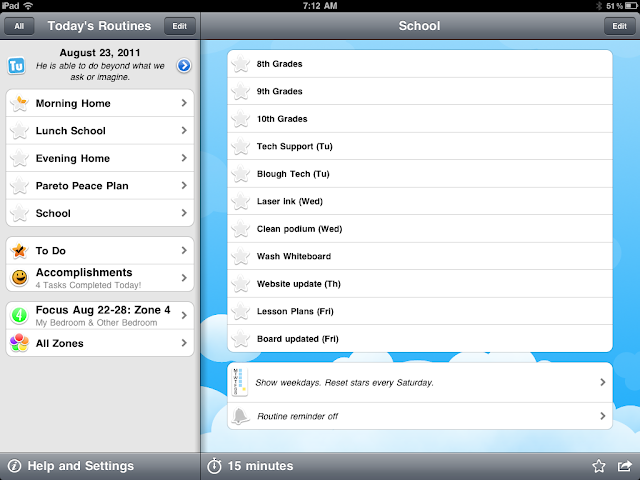 Finally, the beginning and end of day routines are vital and I have a weekly routine for school. I don't mind sharing those with you to get a big picture of things. Morning routine. I get up at 5 am every morning to get started on a GREAT day. Here are the things I do every week at school and the typical days of the week. As long as these things are done each week, I can stay on top of things. Features in Home Routines I don't use. Note that this app has to do's and focus items. 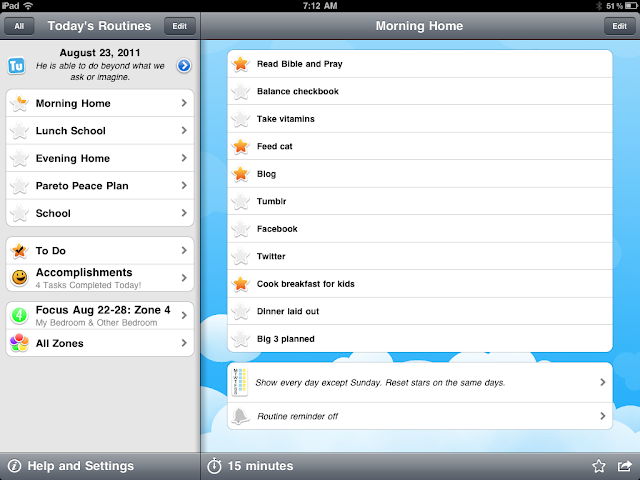 The focus items are based on the flylady and you can do this, but I prefer to use the Motivated Mom's app because they have a printable and the person I have who helps me a few days a week doesn't have an ipad. If you do all the chores yourself, this app would be fine. What are the most important things if I do them every day, that will make the biggest difference in my life? What are the things I need to make sure that I do every week in my job that will make the biggest difference? What are the things I need to make sure that I do every week at home that will make the biggest difference? What are the 20% of my problems that cause 80% of my headaches? What is the one habit that is most important to start in my life right now? (Set an appointment with yourself every day this week to do that one thing. Think about your life. Great lives aren't lived by accident. Not all great lives have a list or are super organized but for me, living intentionally has made a huge difference! Remember your noble calling, teacher. You can be amazing and great - one tiny thing at a time. The little things do make a big difference in the classroom. If you're less stressed about small things then you can focus on the big things -- like your students. There is a friends of Teaching 2030 on the Teacher Leaders Network. This is a national initiative of the center for teaching quality. Zite and Flipboard are two must-have new apps for the iPad. Each is different and an important part of my media diet. The rumor mill is churning up that CNN and Zite are chummy on a deal to sell Zite for $20million+. Mainstream media hasn't really gotten social media or apps- until now? They gotta buy it. Not sure I am happy about this one. Is it Nite Nite Zite? I found that quite a few teachers in the technology forum in Edmodo are using this site for blogging with kids. This is a great service for those of you who want to sort of go paperless and need a virtual place to turn in files. 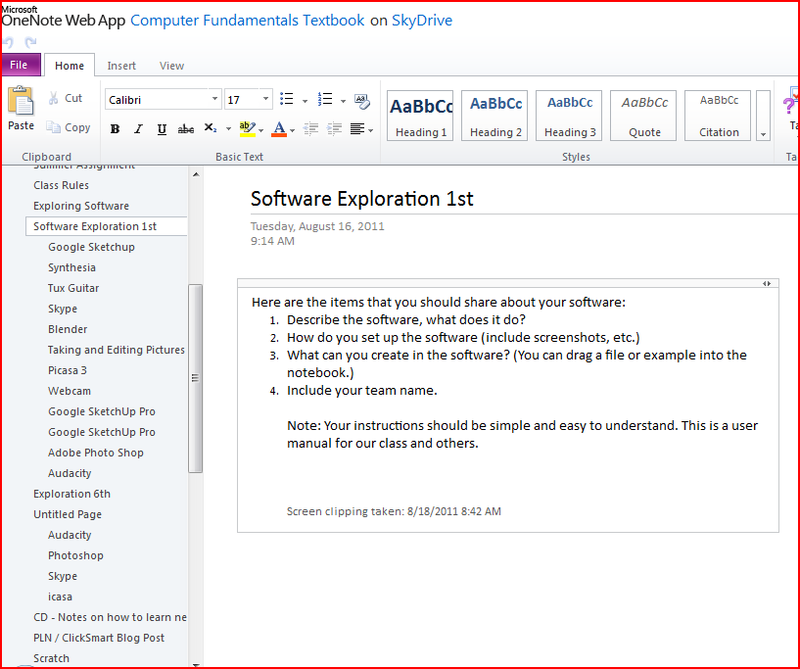 Although the teacher should have dropbox you DO NOT have to have dropbox installed. You can then have them upload files with your secret password that are delivered right to your dropbox inbox in a folder called "Dropittome"
Go to www.dropitto.me and sign up for an account. Remember that your USERNAME will be your link so make it simple. Of course, mine is coolcatteacher but you can make yours whatever you wish. Don't use the same password as Dropbox although you can use the same email. Pick an email so it will let you know when a student has submitted work. Remember to allow it to connect with Dropbox as the screen shows below. 4. Get students ready to share. Come up with a naming mechanism. My 8th grade students have their lessons begin with the letter L, ninth grade uses E (for exercise) and 10th uses A (activity). Every assignment has a standard 3-4 digit series of letters / numbers that they must name the file followed by a dash and their first name. Make sure they know this before they upload! I just write it on the assignment on my board. You might also want to distinguish periods. It might be helpful when you come up with this simple method that you make a poster and hang it on your wall. 5. Share your link and upload password with students. You will get a link and set a password to UPLOAD. This is NOT the same as your account and shouldn't be! Make it something simple that everyone will know. If you are a savvy teacher who has created email lists to send messages to parents, you might want to send them an email with information on uploading the files. Feel free to copy what I used below and adapt it. Make sure that you insert your information in the red locations. This year, the students and I are working to make our classroom as paperless as possible. I've created a private turn in location online for them to hand in their files. and pick the file. They should make sure they name it properly (we covered this in class) so that it will be graded with the other work at the same time and there will be no delay in entering their grade. The password to upload is **insert password**. You may want to note this information in your files or bookmark the link on your home computer if you think they may want to turn in work from home. 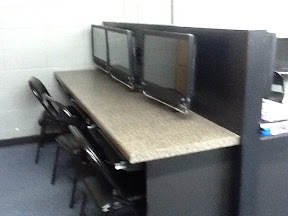 If you don't have a computer or Internet access, don't worry, they will have time in class as well. I am enjoying learning with your student this year. Please contact me if you ever have any questions. I have my students set up a full dropbox and we install them on the local machines. They can drag files into the dropbox. Sometimes, however, there may be a few confidential things that I want handed in separately and this dropbox will be used for that purpose. Can You Use Services Besides Dropbox? Note that the service Send to Dropbox does something similar except with email, however, when I went to the page about this service it is receiving horrible ratings and I don't have time for lost files. Shouldn't everything be Private that is turned in? Many learning management systems (LMS) or course management systems (CMS) have a way to drop files to the professor, but I'd like to point out an article written on Educause that points out that most work should NOT be turned in privately. I'd prefer to have them print to a PDF file and then have the other students annotate edits and suggestions via Adobe acrobat if we're using a word processor, for example. I love my students. Today I will show it. I want my class to be interesting. Today I will be interested in my students. I want my students to learn a lot. Today I will explain where we are going with all this and why. I want to be excellent in what I do. Today I will find one thing each student in my class does excellently well. I want the support of parents. Today I will communicate with them about how their child can succeed and encourage them that parenting is worth it. I want to learn useful things from my PLN. Today I will share useful things to others through my networks. I want to be noticed and encouraged. Today I will go out of my way to notice and encourage others. I want to be an excellent author of books that help people. Today I will share books from other authors that have helped me and help others live their dreams. When I see that what I want can best be gotten by unselfishly focusing on others then TODAY has new meaning. You reap what you sow, if you plant watermelons you aren't harvesting squash. If you plant a life of being helpful to others you will harvest a life you can only begin to imagine. TO - Take this day and think about who you want TO be. Let your TO's influence your DO's. DAY- Remember that this Day is All Yours. It is yours to plan and yours to live. You can start a new habit today. You can be a new person today. You can begin a new journey today. This day is all yours! Be noble. Remember this extends to family, parents, neighbors. Today, make someone else's day really special and by giving such a gift you will begin unwrapping a life of true excellence and meaning. Remember your noble calling, teachers. It is a pleasure to be among you. There is nothing I'd rather do than teach these kids. Excellent article about public feedback that flies in the face of what many are doing. Challenge your thinking. Article sharing how to use dropbox with students when your school will not give them access! Excellent article on google+! one of the best I have found! 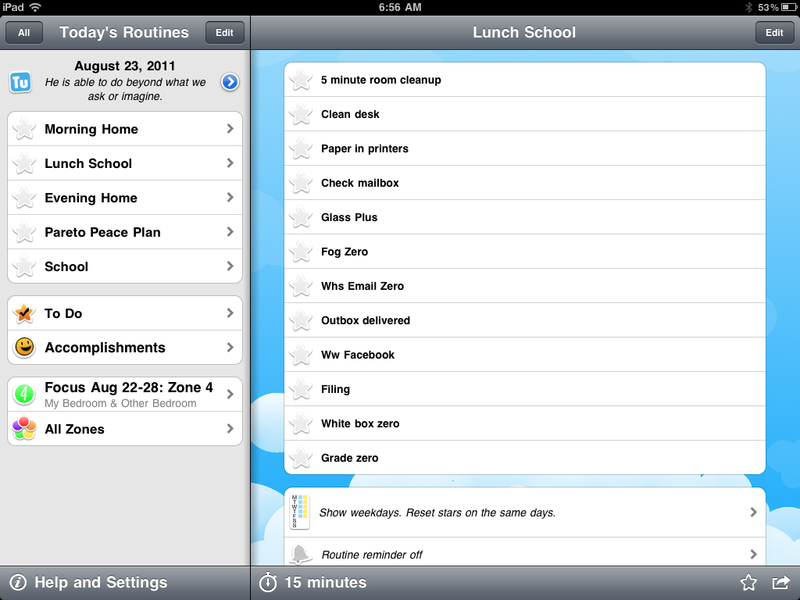 Evernote has bought Skitch and made it free. Android app also. Here is detailed information and dates for the Flat Classroom certified teacher progra. Excited that Westwood alumnus, Krysta Harden - Chief of Staff US Department of Agriculture, is coming to speak to our school on September 23rd. Yes, I'm proud of my tiny little school. We have a lot of cool alumns.